The Former Malaysian even faced death threats regards to the corruption controversy. Former Malaysian leader Najib Razak was questioned by anti-corruption authorities Tuesday over a financial scandal after his shock election loss, as the country's top graft fighter revealed he faced harassment and threats during an earlier probe of the controversy. Najib's coalition suffered a defeat at the May 9 poll, beaten by a reformist alliance led by Mahathir Mohamad, which broke their six-decade stranglehold on power. Mahathir, who first served as premier from 1981-2003 and came out of retirement aged 92 to take on Najib, campaigned on claims that the former leader and his cronies looted sovereign wealth fund 1MDB. Billions of dollars were allegedly stolen from the fund in a sophisticated fraud, and used to buy everything from artworks to high-end real estate. Najib and his reviled, luxury-loving wife Rosmah Mansor have had a swift fall from grace. They have been barred from leaving the country, and police have seized handbags, jewels and cash during raids on properties linked to the couple. Public disgust at the corruption allegations swirling around them at a time middle-class Malaysians were suffering due to rising living costs and stagnant salaries was seen as a major factor in Najib's defeat. 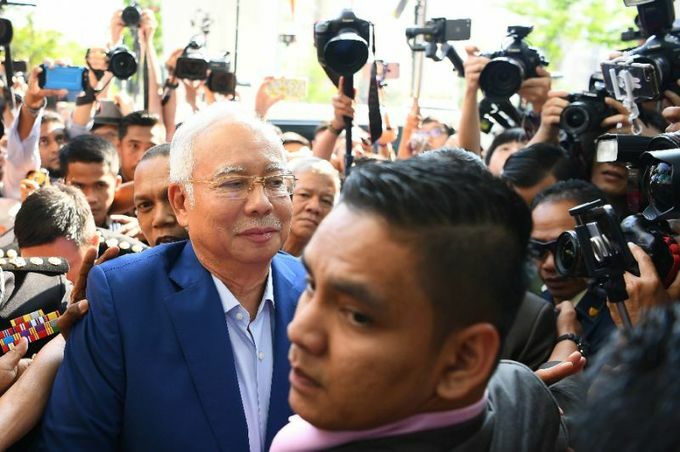 The ousted leader arrived at the Malaysian Anti-Corruption Commission (MACC) headquarters in the administrative capital of Putrajaya, walking through a scrum of about 100 journalists. Najib was summoned by the MACC to give a statement over claims millions of dollars from SRC International, an energy company that was originally a subsidiary of 1MDB, ended up in his personal bank accounts. It is just one small part in the graft scandal, which is being investigated in several countries. As speculation swirls about an imminent detention, the new MACC chief, Shukri Abdull, said Najib would not be charged on Tuesday. The toppled regime went to great lengths to suppress scrutiny of the problems surrounding 1MDB, closing down domestic probes, sacking critics from government, jailing those who spoke out and muzzling the media. Shukri, a long-time senior figure in the anti-graft agency who retired but has been brought back by Mahathir, shed tears at a press conference as he told how he came under "tremendous pressure" during an earlier probe into 1MDB. He was part of a team that originally investigated SRC in 2015, and said he faced harassment which reached a "very frightening" level. "Our witnesses were abducted. Some of them were questioned by others as to what they revealed to us," he said. "I was asked to retire early." He said friends informed him that he could be arrested, prompting him to head to the United States for a while. "The allegation was that I conspired to topple the government," he said. "Despite the threats and harassment faced by my officers during the investigations, we never gave up." As pressure mounted, Shukri decided to retire in 2016. According to an investigation by the Wall Street Journal, 42 million ringgit ($10.6 million) originating from SRC was transferred to Najib's personal bank accounts. Hundreds of millions of dollars from 1MDB allegedly ended up there. Najib and 1MDB have denied any wrongdoing. A domestic investigation launched during his premiership concluded that the money in his accounts was a donation from the Saudi royal family. Mahathir has vowed to fully investigate the financial scandal and on Monday the new government set up a task force headed by high-ranking current and former officials to probe the controversy. Following the fall of the corruption-riddled regime, which had led Malaysia since independence from Britain in 1957, figures linked to the 1MDB scandal have been making appearances. Mahathir met at the weekend with Xavier Justo, a former executive with PetroSaudi, a company that was allegedly involved in corrupt deals with 1MDB. The Swiss national is believed to have leaked documents related to the scandal to the media. He was jailed in Thailand for attempting to blackmail his former employer but was released in 2016.